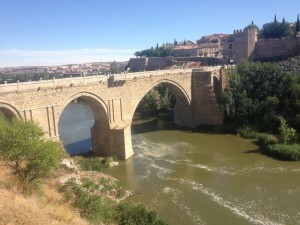 My next great, short adventure following Madrid was Toledo, Spain. Toledo is a very historical city with extensive history from the Muslim, Jewish, and Christian cultures. As we arrived into Toledo by bus, all of us were in awe at the incredible wonder that is Toledo. As you arrive to the foot of Toledo, one immediately views many homes, antique buildings, and grand churches in the middle of a desolate (but beautiful) area. It is amazing to see because amongst a much uninhabited area, is a marvelous city as Toledo. As soon as we got off the bus, we saw a wonderful river, the Tagus River. Tagus River is the longest river in the Iberian Peninsula, at 645 miles long. It was amazing to view something so beautiful because I have not had the chance to view many things as powerful as this in my time in America. From here we began our four hour long walking tour, and I was not the smartest in this sense because I wore sandals as I was unaware of the distance of the walking tour. We walked approximately six miles on this tour, and by the end of it my feet were torn to shreds. This is one of the times I would have changed in order to make my time a little more enjoyable, but all in all the tour was still absolutely amazing. We began the tour walking over a grand bridge called the Alcantara Bridge (pictured below) over the Tagus River. This was an incredible bridge built originally by the Roman Empire in 106 A.D. Through the tour we were able to see many astounding Gothic style buildings, including the Primate Cathedral of Saint Mary. The Primate Cathedral was my favorite site in all of Toledo (and maybe in all of Spain) because of the amount of its historical value and the astonishing size of the Cathedral. The Roman Empire built the Primate Cathedral in the 13th Century. Over the years the Cathedral had been changed into a mosque, then into a Jewish temple, and then back into a Catholic Cathedral. It is interesting because there are still Jewish and Muslim traces within the city of Toledo, and the Primate Cathedral itself. 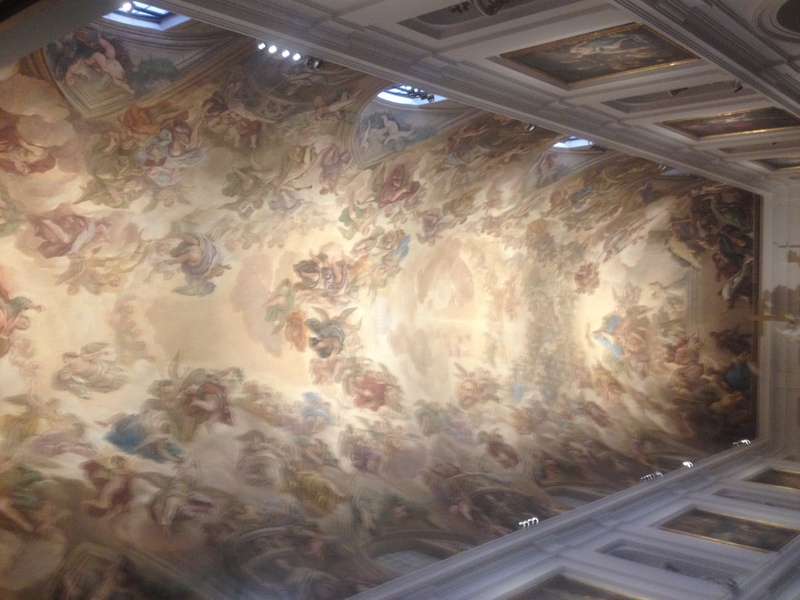 One of the most beautiful paintings I have ever viewed was on the ceiling of the Primate Cathedral. Pictured below, is an incredible painting created by Luca Giordano in 1697. The miraculous thing about the painting is that Giordano created this masterpiece in roughly 3 months. I could not believe this as the painting was so large and beautiful. Toledo has been an incredible part of my trip in Spain, with it being a very relaxing city while involving much historical significance and many beautiful sites. This entry was posted in Uncategorized by tashai01. Bookmark the permalink. 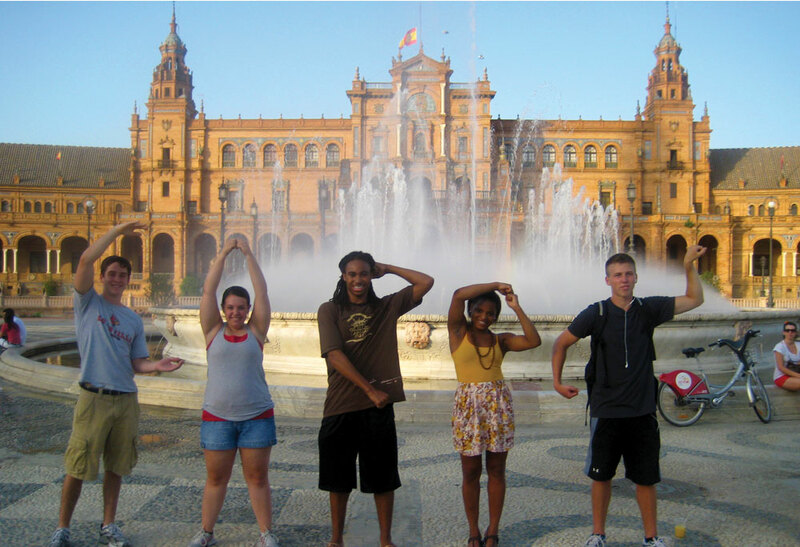 I am a student at the University of Louisville pursuing further education in the study of Spanish. I am an Economics major with minors in International Business, Marketing, and Spanish.